For weeks now, I have been listening to and been inspired by this extraordinary compilation of 18 songs. They’re on on two CDs – music from around the world, beautifully recorded, varied, and a source of continued pleasure. Call them folk, or roots; you don’t have to understand the words to grasp the languages, be they of love, or longing, celebration, an invitation to dance, or a call to heal. While this collection can serve as a primer for further exploration, it can be enjoyed simply for what it is. Disc 1 opens with vocalist Ana Alcaide singing El Pozo Amargo (bitter pit), the bittersweet lament about Sephardic Jews having to leave Toledo. Gorgeous. André Hazz and his Lebanese music ensemble with their Mah’Iqaa and Rossy’s polyrhythmic Madigaskara will provide an incredible lift. Nour Eddine fascinates with the call-and-response Bania, inspired by Gnawa traditions. Finnish, Roma, Corsican, and Klezmer traditional music are among other uplifting cuts. And there’s more on Disc 2, African, Tibetan, Chinese, Klezmer, Russian, Spanish, Portuguese – opening a few veins from what seems to be an endless storehouse of gems – a truly remarkable primer. 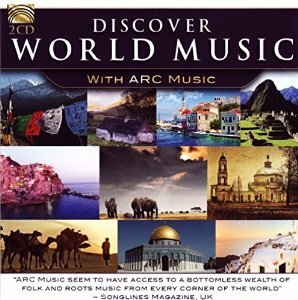 Be the first to comment on "CD Review: Discover World Music (Various Artists)"